It can be used at many situations, such as getting together occasion, weddings,work,graduation,activities,any big events or decorations etc. 2. Size:210cm X 150cm 7 X 5FT. 8. Easy to hang up straightly or naturally. Each package has only one item, if you are buying more items at one time, we will put them all in one package, but please kindly let us know if you need seperate pakages. If the product shows creases because of folding or else, do not worry , there are ways to solve. 1. Roll it up tightly with a cylinder for 3-4 days, it will be ok .
2. Heat it with a steam iron from the reverse side of item, then it will be smooth again. Used for birthday party. 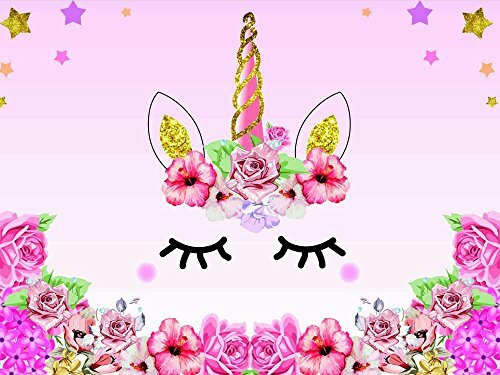 Unicorn Theme Backdrops.